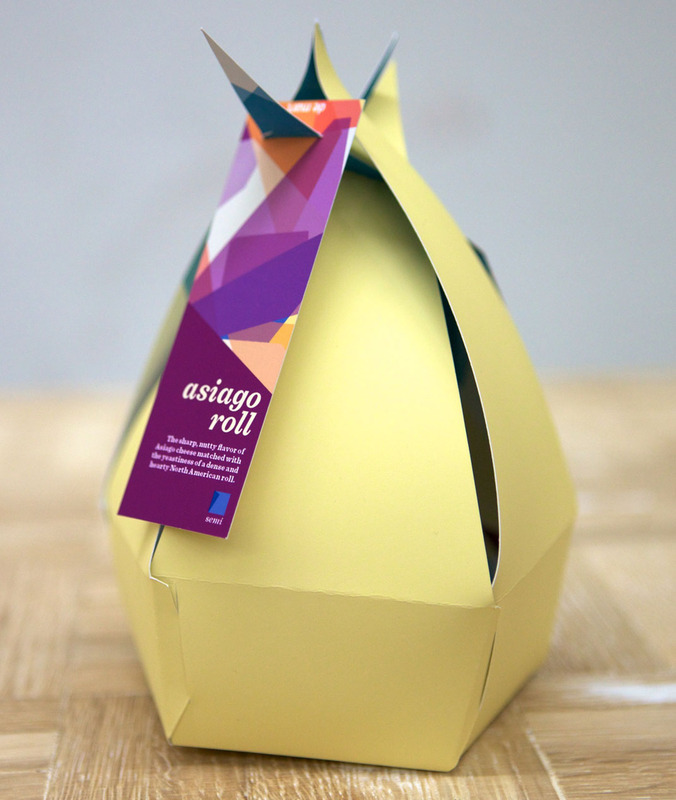 A branding, packaging, and brand launch campaign created in conjunction with Juan Cifuentes, Patrick Dougherty, Spenser Garden, and Baktaash Sorkhabi. 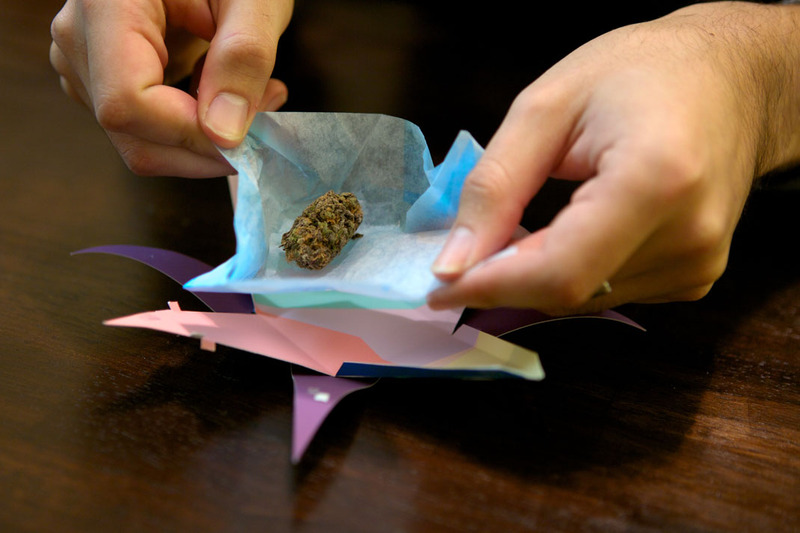 The Brief: In November of 2010, the passage of Proposition 19 on the California ballot would have made the sale and possession of marijuana legal within the state. Faced with this current issue, we were asked: if marijuana were legal, how would it be sold? And immediately after that, we were asked a question that was even closer to our profession: how would it be branded? Research: We built case studies focusing on marijuana internationally – the coffee shops of Amsterdam – as well as the domestic situation in California concerning marijuana dispensaries. We also polled approximately 130 people – both on the street and online – and found that the perception of and attitude towards marijuana was largely neutral. That being said, there were some negative connotations that arose that we wished to avoid, namely stereotypical symbols (marijuana leaf, exclusive use of the color green, etc. ), steering clear of clichéd imagery (Bob Marley, Rastafarian culture, et al), and keeping the smoking aspect of the brand to a minimum in order to avoid hackneyed undertones. Concept: Wanting to stay away from the smoking facet of marijuana we decided to concentrate our efforts on creating a brand that sold THC in edible forms, albeit in an innovative way. Looking at the landscape of current brands that we would be competing against – bars, cafés, and lounges – we devised a concept which focuses on enhancing your day with a range of THC-infused products in an atmosphere that is whimsical, novel, refined, and colorful. 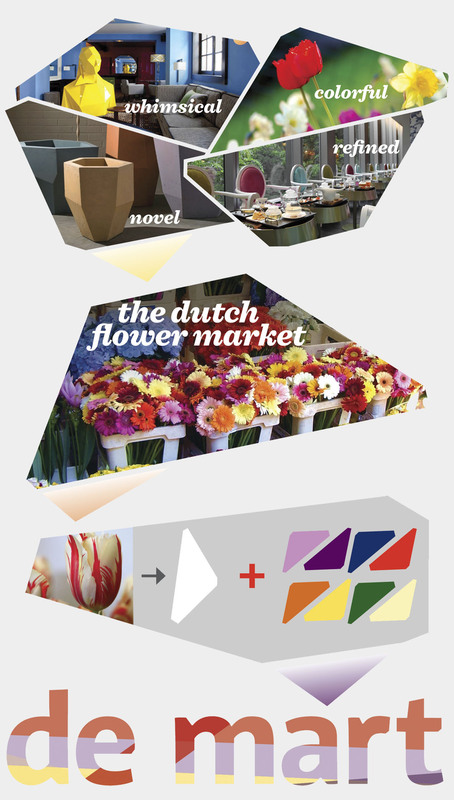 Our concepting led us to the Dutch flower market – a venue full of vibrant and eclectic smells and sights. 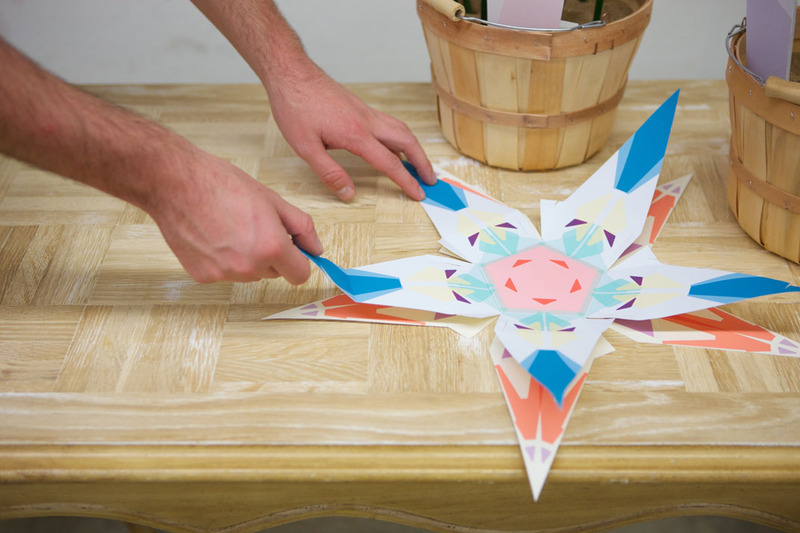 From this concept we derived an abstract geometric flower petal, as well as an array of bold colors which we would utilize. 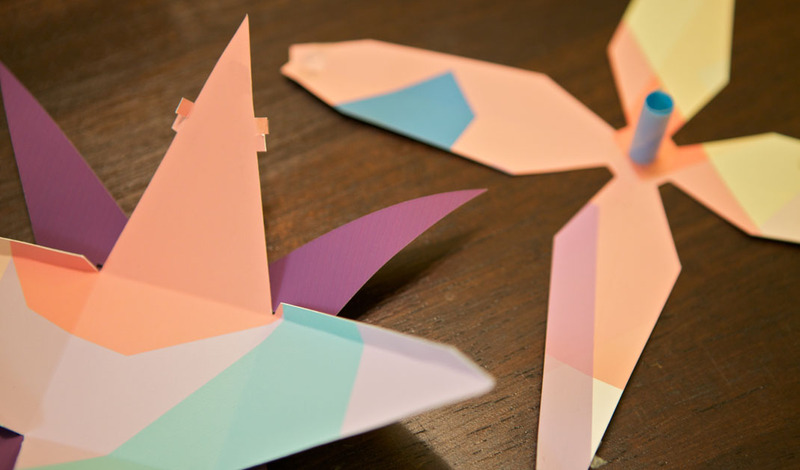 Using these elements, we would create a brand that is eclectic and astounding. Packaging: In order to more effectively market our product, we created a potency system that would inform consumers of the intensity of the goods that they would be buying. We divided our system into two classes: Sun denotes cannabis sativa, which produces a lively, vibrant feeling; Shade indicates cannabis indica, a strain that engenders a sense of calm and tranquility. 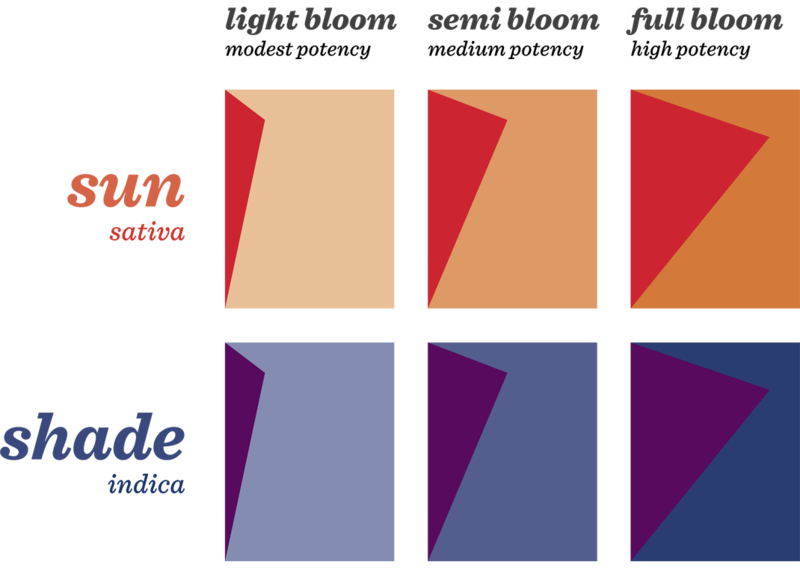 These two categories are further divided into three potency levels: light bloom, semi bloom, and full bloom, indicating modest, medium, and high potency levels, respectively. 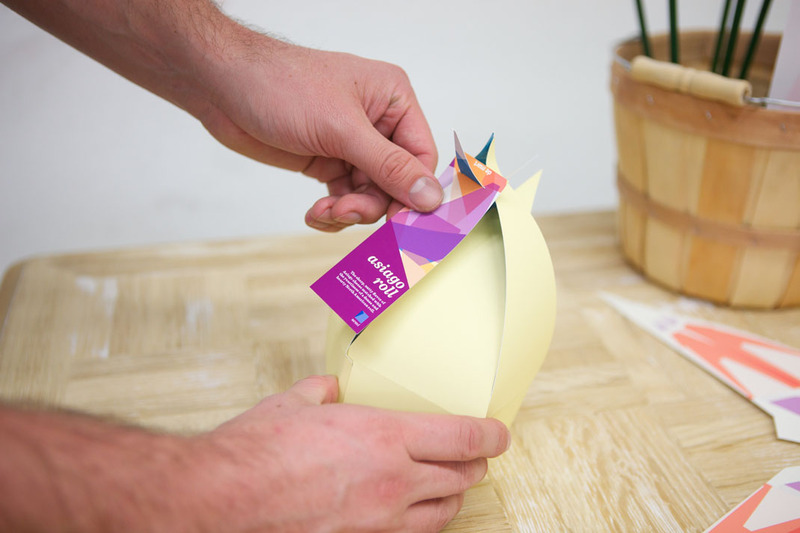 Keeping with the concept of enhancing, we wanted our packaging to be objects that would be surprising and delightful to the customer once they got it in their home. 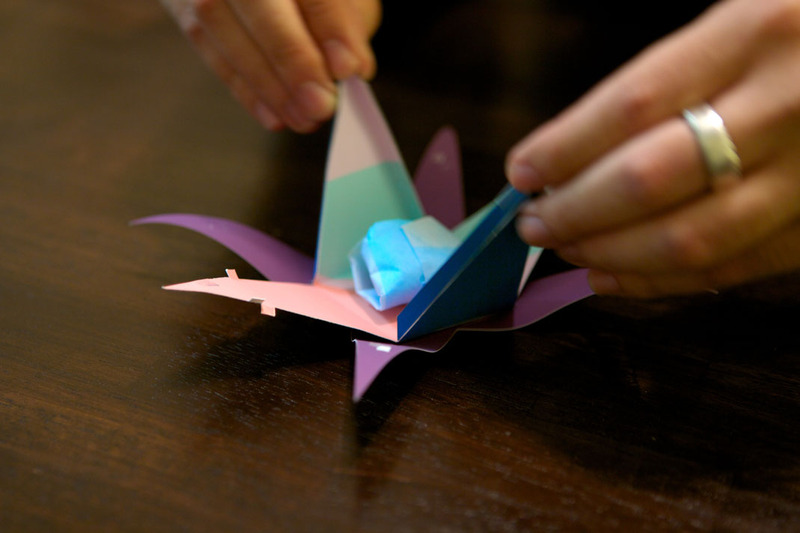 To achieve this, we used the idea of the bloom. 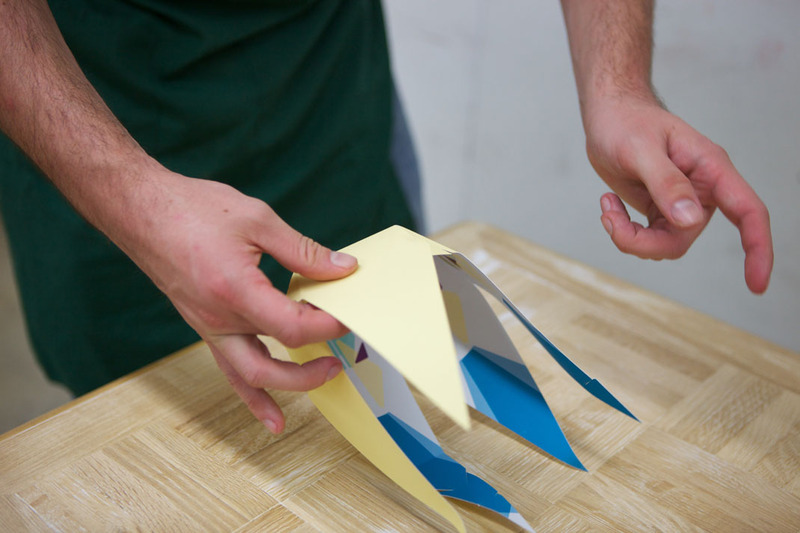 Our packages would be vibrant – but rather unassuming – while closed. 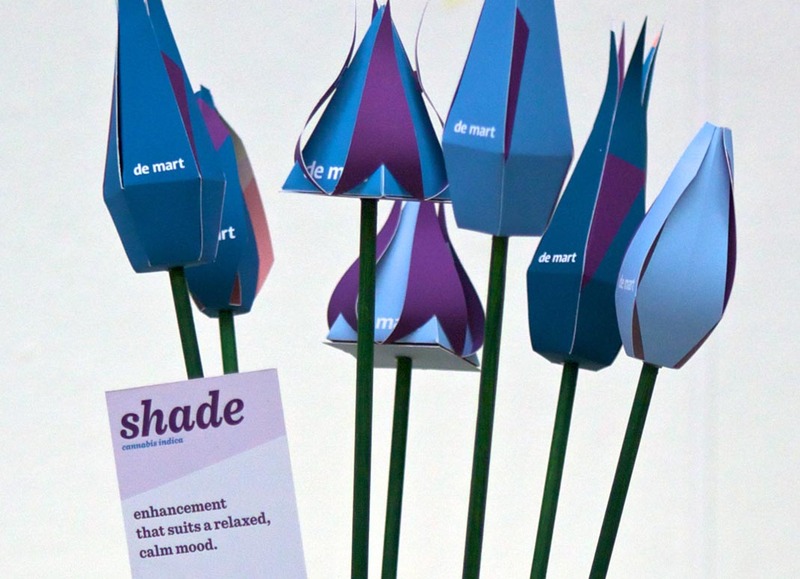 However, opening the package would reveal a vibrant and bold interior; both states being akin to a flower before and after blooming. While we did not want smoke in the eatery itself, we still realized that selling virgin marijuana would be an avenue worth exploring – we would sell straight marijuana which customers could then take with them to enhance in their home. 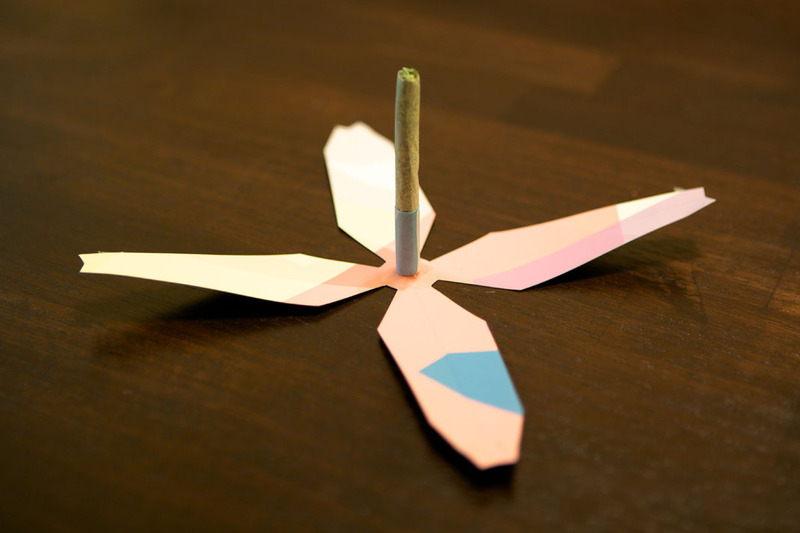 To this end, we created packages in which pre-packed marijuana in several different forms would be sold; pre-packed joints and marijuana nuggets, as well as their “blooming” states, are shown here. 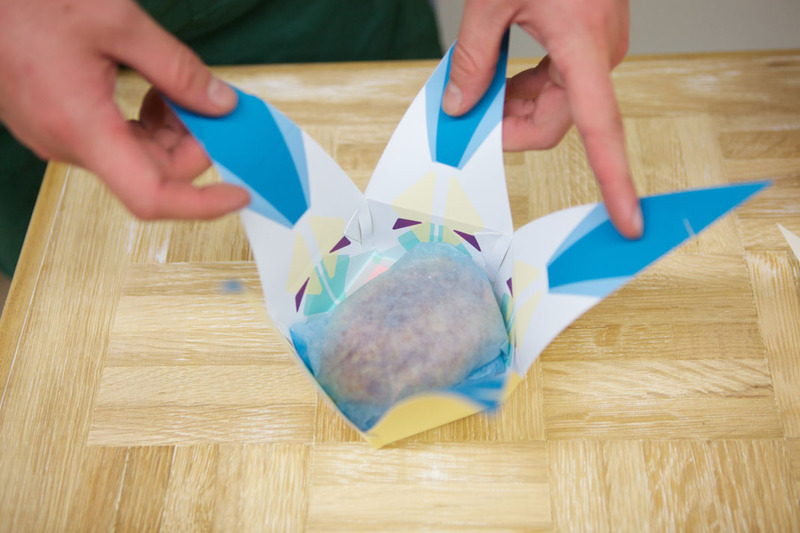 Take-away packages follow the same ethos – customers buying pre-made foodstuffs would have their product packaged in a fairly reserved package, which would reveal its vibrant interior upon opening. 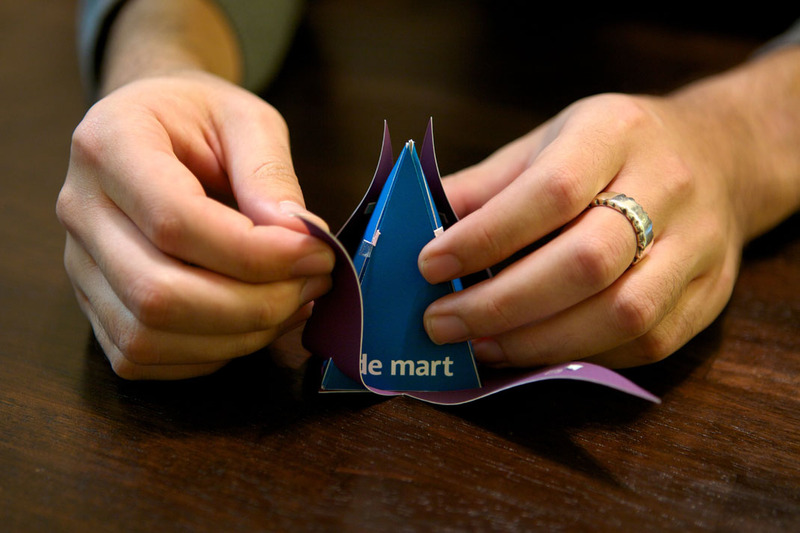 Take-away packages would also emphasize the gesture and the pantomime of the package itself – packages would start out flat and be folded into shape by the attendant behind the counter, relating the distinctive and dynamic nature of the package to the customer while they are watching the process of it being formed. Area Design: As an eatery we felt that the design of the physical space itself would be most reflective of our concept. Located in downtown Los Angeles – an area of fantastic architectural diversity – we would use a pre-existing building so as to be a good neighbor to the surrounding spaces. 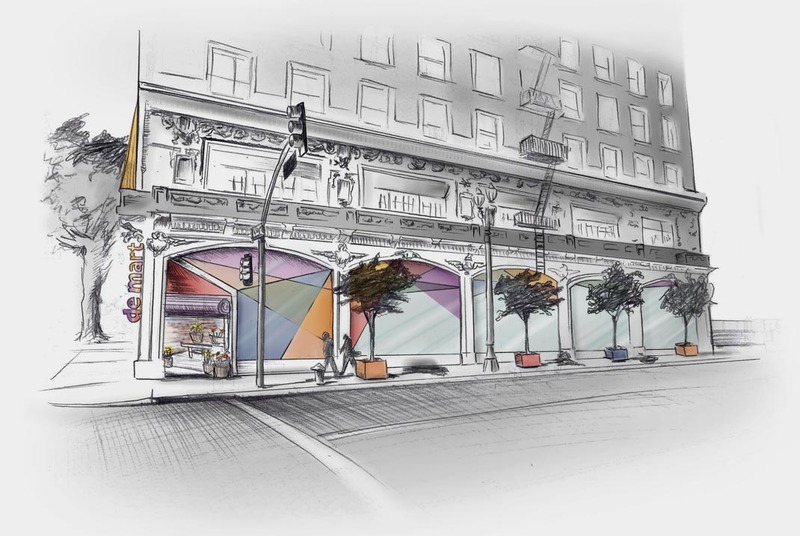 The exterior of the building would distinguish itself with the use of geometric, colored glass in multiple layers, as well as vivid planters and signage. 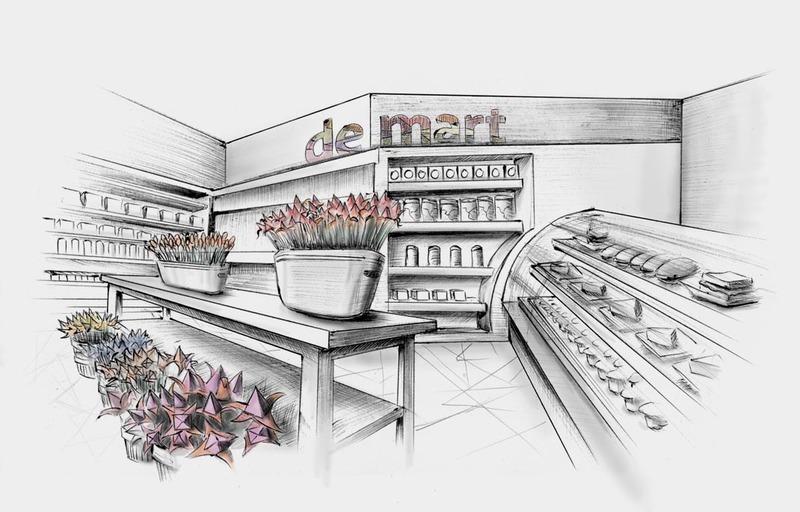 This juxtaposition of old and new would serve to speak to the eclectic nature of the de mart brand. 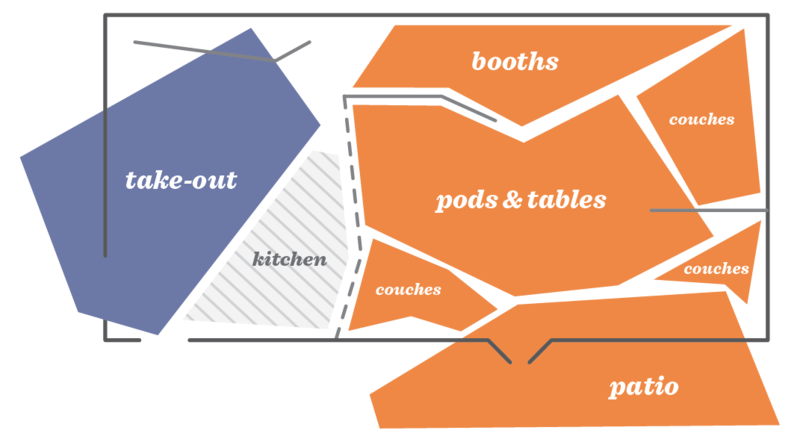 We divided the eatery into two sections: take-out and sit-down. The take-out area – accessible from the outside of the building via a roll-up door a la a flower market – would sell pre-packaged marijuana, as well as on-the-go food such as sandwiches, soups and salads; these can be purchased with or without THC. 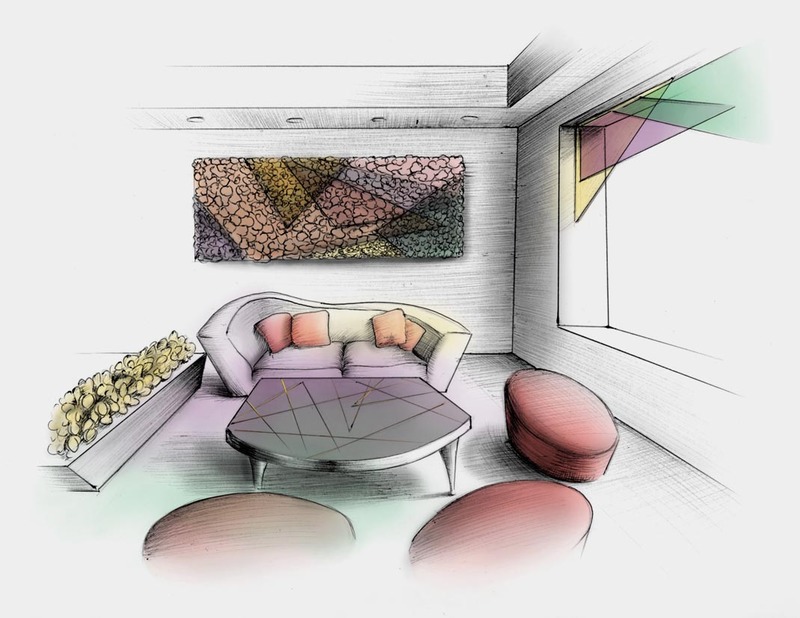 Keeping in line with the idea of enhancing, contrasting textures would create an atmosphere that would exalt the senses, while simple groupings of color would add visual balance to the environment. The sit-down area would aim to be a place for everyone. 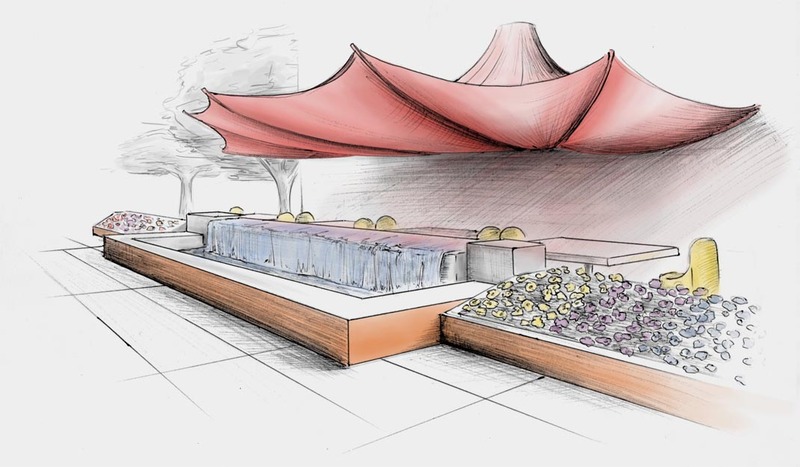 A common area of pods and tables would provide a lively social space, while secluded couches and booths would afford more private areas; an outdoor patio would also allow customers to dine while soaking in the street views of Los Angeles. Again, keeping with enhancing, soft and rough fabrics of the furnishings give textural contrast, while the tinted glass of the windows would impart a constant change of color. 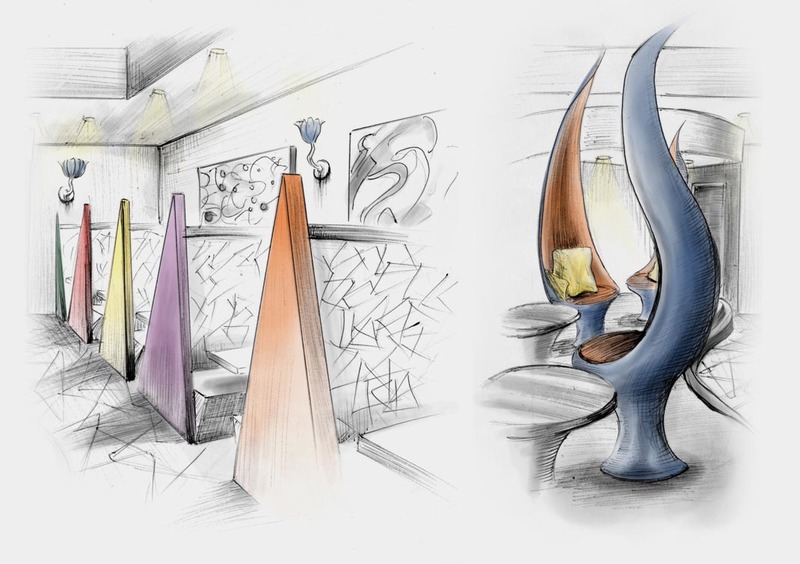 All the while, the organic forms of colorful floral arrangements would contrast with the geometry of the space. 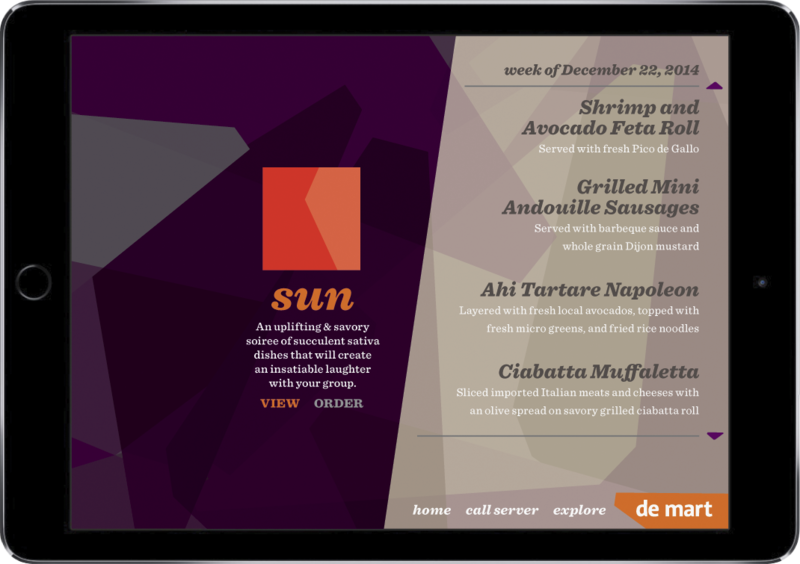 Interactive & Advertising: As an unconventional space, we felt that we had a lot of freedom to break from the normal paper-bound-in-leather approach of menu design and instead opted to design our menu digitally. 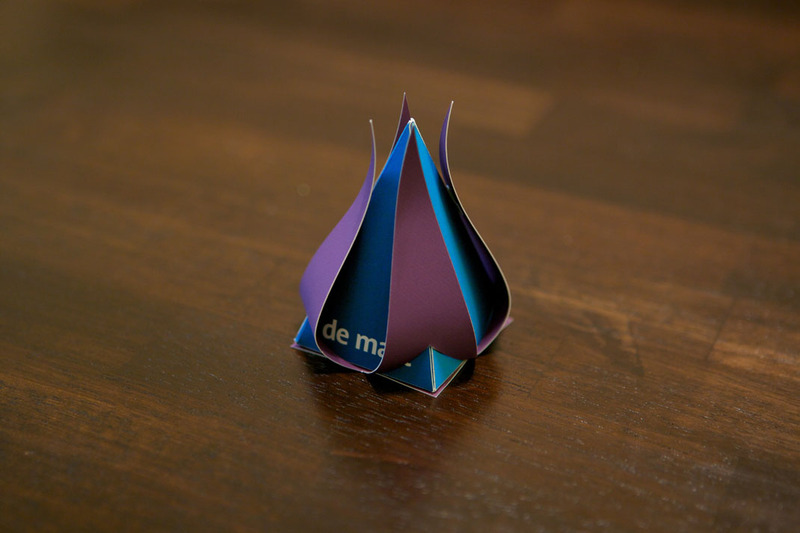 Not only that, but since de mart is a tapas style eatery, our menu would change weekly – designing digitally would not only enable us to provide an interactive element, but it would also be more sustainable. 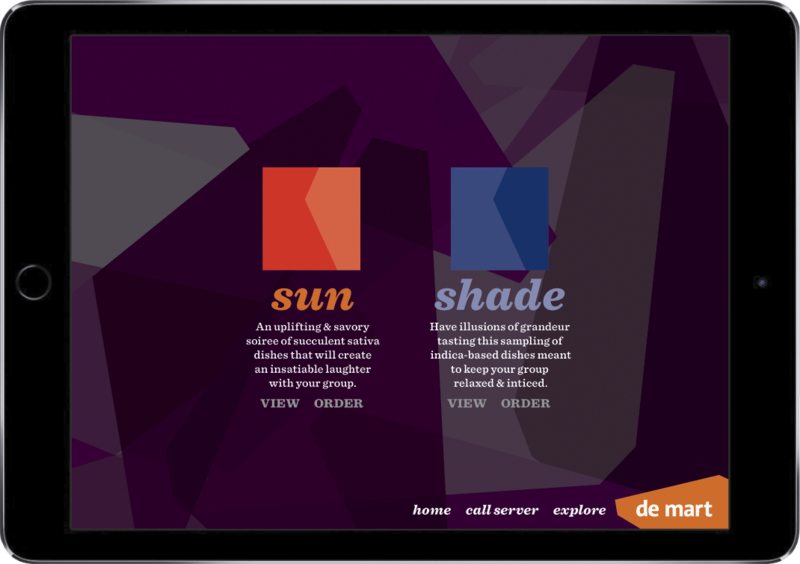 To that end, each table would be equipped with an iPad with which customers could tap into the de mart experience. Upon being shown to their seats, customers would be presented with a welcome screen asking them how they would like to enhance their day. Our prix fixe options would provide a selection of complimentary and delectable dishes; customers could opt to order a la carte, as well. 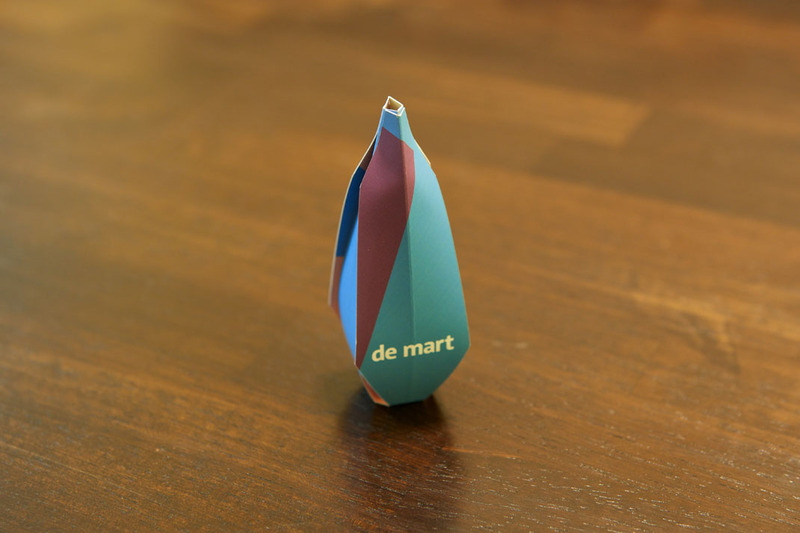 During checkout, customers would also be given the options of checking into de mart on Yelp or foursquare to review their experience. Customers could also access a virtual jukebox to see what it currently playing, as well as choose the next track in the queue. Conversely, were the customer to take their meal to go, they could access the de mart Pandora channel and stream the music playing in our space into their home. This would also offer us an avenue for targeted advertising. 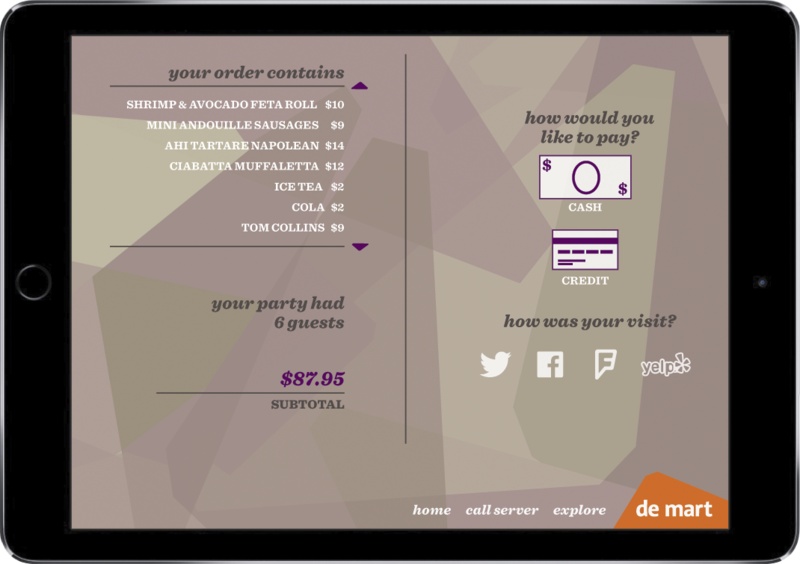 An iPhone application would also allow ordering on-the-go which could then be picked up in-store. In addition to online advertising, we would launch a non-traditional campaign to coincide with the grand opening of the space. All around Los Angeles, passersby would encounter monumental sculptures of various utensils covered in flowers. Nearby these sculptures, a plaque reading “Cutlery, enhanced” would contain a QR code which people could then scan with their mobile phone to access a 25%-off coupon for both online and in-store purchases. 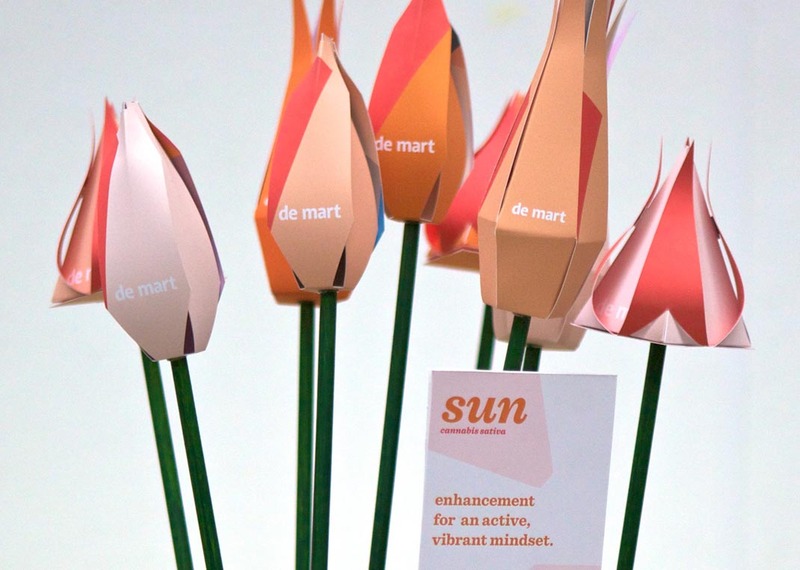 This whimsical and novel approach to environmental advertising speaks to the eclectic nature of the de mart brand.